Our group is interested in understanding the role of complex glycans in human health and disease using chemistry and chemical biology. We work on two distinct approaches towards this goal. Approach 1: Development of new methods for stereoselective glycolsylation. The first approach is the chemical synthesis of glycans that can be used for the development of glycotherapeutics such as conjugate vaccines. The chemical synthesis of glycans, and especially the stereoselective synthesis of glycosidic bonds, is challenging. 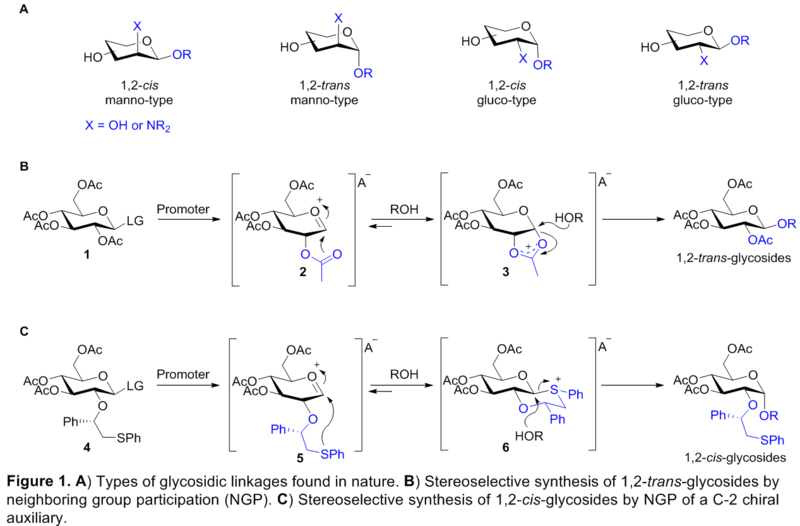 Hence, we are developing new general methods to stereoselectively synthesize glycosidic bonds. The synthesis of 1,2-cis-glycosides is much more challenging and no general method is available at this point.14,15 The method that has the greatest potential to become generally applied for the preparation of 1,2-cis-glycosides uses another type of participating functionality ((S)-(phenylthiomethyl)benzyl ether) at C-2 (Figure 1C, blue).19-21 After departure of the leaving group of 4, oxacarbenium ion 5 is trapped by the chiral auxiliary to form the quasi stable sulfonium ion 6, formed exclusively as the trans-decalin system due to the equatorial orientation of the phenyl substituent and because the cis-decalin system experiences more gauche interactions.19,21 Now, only the face on the same side as the C-2 substituent is available for attack by the glycosyl acceptor alcohol (ROH), leading to the stereoselective formation of 1,2-cis glycosides. We are now working on second generation participating groups that are more selective, more robus and easier to synthesize. Using this newly developed methodology we will prepare new glycovaccines. Approach 2: Development of new Glycotools to better understand the role of abberant glycosylation in disease. Carbohydrates present at the outermost part of the chemical barrier protecting underlying human tissue. Ironically, a large number of pathogens have evolved to invade and colonize a host by expressing proteins and toxins with high binding affinity for these cell surface carbohydrates. In addition aberrant expression of carbohydrates on cancer cells are can protect cancer cells from apoptosis, promote metastasis and has been suggested to confer resistance to therapy 22-26. We are therefore interested in the design and synthesis of glycomimetics that can alter the glycocalyx. For example, we have modified sialic acids using bioorthogonal chemistry27 to selectively bind Siglecs (sialic acid-binding immunoglobulin-like lectins).28 To this end we designed a new sialic acid probe propargyloxycarbonyl sialic acid (Ac5NeuNPoc) for sialic acid glycoengineering. Ac5NeuNPoc showed strongly increased labeling efficiency and exhibited less toxicity compared to widely used mannosamine analogs in vitro and was also more efficiently incorporated into sialoglycans in vivo. Unlike mannosamine analogs, Ac5NeuNPoc was exclusively utilized in the sialoglycan biosynthesis pathway. By modification of Ac5NeuNPoc treated cells we are able of modulate Siglec binding (Figure 2). Using a combination of chemical synthesis, bioinformatics and cell biology we are developing more potent ligands and exploring the application of this methodology in cancer and auto-immunity. (1) Dwek, R. A. Chemical Reviews 1996, 96, 683. (2) Hart, G. W.; Copeland, R. J. Cell 2010, 143, 672. (3) Varki, A. Glycobiology 1993, 3, 97. (4) Bucior, I.; Burger, M. M. Curr. Op. Struct. Biol. 2004, 14, 631. (5) Ohtsubo, K.; Marth, J. D. Cell 2006, 126, 855. (6) Hart, G. W.; Housley, M. P.; Slawson, C. Nature 2007, 446, 1017. (7) Bishop, J. R.; Schuksz, M.; Esko, J. D. Nature 2007, 446, 1030. (8) Kleene, R.; Schachner, M. Nat. Rev. Neurosci. 2004, 5, 195. (9) Trent, M. S.; Stead, C. M.; Tran, A. X.; Hankins, J. V. J. Endotoxin Res. 2006, 12, 205. (10) Miller, S. I.; Ernst, R. K.; Bader, M. W. Nat. Rev. Microbiol. 2005, 3, 36. (11) Weidenmaier, C.; Peschel, A. Nat. Rev. Microbiol. 2008, 6, 276. (12) Sahly, H.; Keisari, Y.; Crouch, E.; Sharon, N.; Ofek, I. Infect. Immun. 2008, 76, 1322. (13) Boons, G. J.; Hale, K. J. 2000. (14) Zhu, X. M.; Schmidt, R. R. Angew. Chem., Int. Ed. 2009, 48, 1900. (15) Boltje, T. J.; Buskas, T.; Boons, G. J. Nat Chem 2009, 1, 611. (16) Plante, O. J.; Palmacci, E. R.; Seeberger, P. H. Science 2001, 291, 1523. (17) Seeberger, P. H. Chemical Society Reviews 2008, 37, 19. (18) Seeberger, P. H.; Werz, D. B. Nature Reviews Drug Discovery 2005, 4, 751. (19) Kim, J. H.; Yang, H.; Park, J.; Boons, G. J. J. Am. Chem. Soc. 2005, 127, 12090. (20) Boltje, T. J.; Kim, J. H.; Park, J.; Boons, G. J. Nat Chem 2010, 1, 611. (21) Boltje, T. J.; Kim, J. H.; Park, J.; Boons, G. J. Org Lett 2011, 13, 284. (22) Swindall, A. F.; Bellis, S. L. J Biol Chem 2011, 286, 22982. (23) Amano, M.; Eriksson, H.; Manning, J. C.; Detjen, K. M.; Andre, S.; Nishimura, S.; Lehtio, J.; Gabius, H. J. Febs J 2012, 279, 4062. (24) Cui, H.; Lin, Y.; Yue, L.; Zhao, X.; Liu, J. Oncol Rep 2011, 25, 1365. (25) Lee, M.; Lee, H. J.; Bae, S.; Lee, Y. S. Mol Cancer Res 2008, 6, 1316. (26) Park, J. J.; Yi, J. Y.; Jin, Y. B.; Lee, Y. J.; Lee, J. S.; Lee, Y. S.; Ko, Y. G.; Lee, M. Biochem Pharmacol 2012, 83, 849. (27) Mahal, L. K.; Yarema, K. J.; Bertozzi, C. R. Science 1997, 276, 1125. (28) Büll C, Heise T., Beurskens D.M.H., Riemersma M., Ashikov A., Rutjes F.P.J.T., van Kuppevelt T.H., Lefeber D.J., den Brok M.H., Adema G.J. * & Boltje T.J.* ACS Chem. Biol., 10, 2353.